Dub Colossus is the visionary project of Dubulah – aka Nick Page - an amazing band of Ethiopian and UK musicians exploring the Dub Fusion possibilities of Ethiopian music, Reggae, Jazz and beyond. 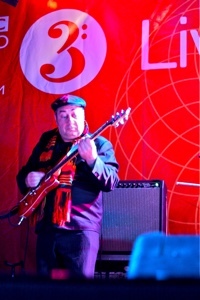 Composer, guitarist, bass player and programmer Nick has worked with a long list of notable artists and eccentrics. In 1990 he formed Trans-Global Underground with Tim Whelan and Hammid Man-Tu, produced-wrote-played six albums before leaving in 1997 to form Temple of Sound with Neil Sparkes. 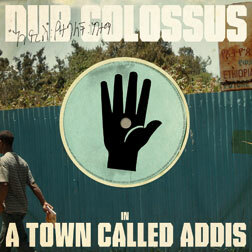 Dub Colossus's first album A Town Called Addis was inspired by meeting, writing and working with Ethiopian singers and musicians in Addis Ababa in August 2006. 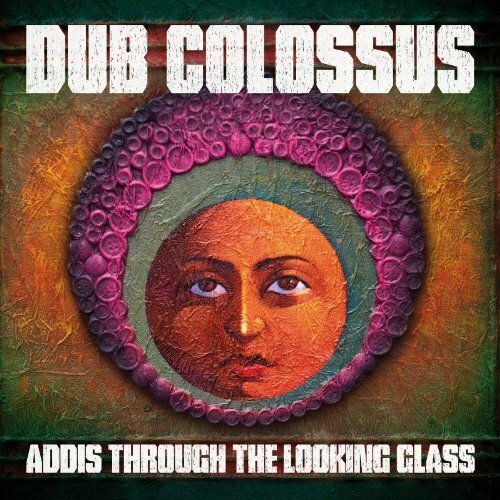 The collaboration between Dub Colossus and these amazing musicians covers Azmari and traditional styles as well as the popular singing styles of the 60s and 70s. 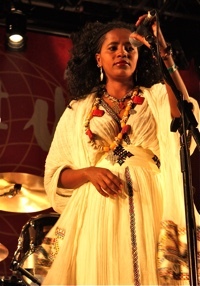 Singer Sintayehu ‘Mimi’ Zenebe is known as “the Edith Piaf” of Ethiopian song and owns the Doku Club in Addis, a venue devoted to traditional Azmari music. 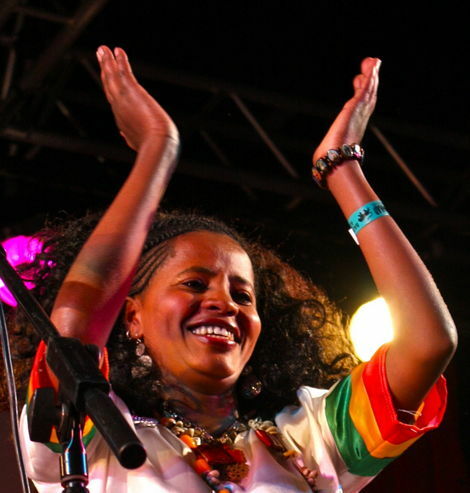 Fellow singer, Tsedenia Gebremarkos, is a well-known and respected performer and radio presenter, and winner of a Kora award as the best female singer in East Africa in 2004. A Town Called Addis was released in the autumn of 2008 to much critical acclaim. The band toured throughout 2009, and into early 2010, playing at festivals across europe and beyond, finishing in New Zealand. From Glastonbury, to WOMAD, audiences have delighted in the big sounds created by this big band. The full 12 piece Dub Colossus live band is a tight, vibrant and exciting band. A spectacle to behold, the band includes a four piece brass section, percussion, keyboards, krar, bass, drums, guitar, and of course the stunning vocals of Tsedenia and Mimi, mixing up traditional Ethiopian sounds with modern dub twist. Riding high after a summer spent recording and mxing a new album, the band are back, and on better form than ever! The second album ‘Addis Through The Looking Glass’ was released in April 2011 to much acclaim. “The aim”, says Nick Page, the musician and producer best-known as Dubulah, also founding member of Transglobal Underground and Syriana, “is to constantly surprise.” The new Dub Colossus album, Addis Through The Looking Glass, does just that. It’s a new departure in the band’s remarkable history. Dubulah first travelled to Ethiopia’s capital Addis Ababa in 2006 to collaborate with musicians and explore traditional Azmari styles, 60s Ethiopian pop, Ethiojazz and 70s Jamaican Dub Reggae. There he came across some amazingly talented artists and Dub Colossus was born. Now comes a lengthy, even more varied and sophisticated album that moves the experiment on – with the Ethiopian contingent playing a greater role in the proceedings. It’s still an experimental fusion set, not a straightforward recording of Ethiopian songs, but the successes of the past two years have led to growing trust and confidence in the band. “This time they were saying to me “we’d like to show you our take on it, rather than you interpreting us”, explains Dubulah. “It was a good exchange. They would come up with the subject matter, and ideas for the next phase of the group. And I’d transport some of their ideas into another world”. As with the first album, recording took place mostly in Addis Ababa, where a local musician Abiyou Solomon, who plays bass on the album, lent the band a room in his house to use as a studio, “and it was brilliant – there were three cupboards which we could use as vocal booths, or put the horn section. It all worked well apart from the sound of rain on the roof – the rain hits very hard in Addis”. There were further sessions in the UK, where another set of musicians became involved. 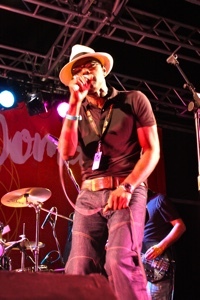 They include the reggae singer Mykaell Riley, famous for his work with Steel Pulse, Jamiroquai’s drummer Nick Van Gelder, the Horns of Negus brass section, bass work from Dr Das of the Asian Dub Foundation, and double bass from Bernard O’Neill, who works with Dubulah in the Arabic-influenced Syriana. As for Dubulah himself, he plays guitar, bass, harmonicas and keyboards, produced the set, and co-wrote several of the songs. The result is an album that constantly surprises and constantly changes direction, from atmospheric, wide-screen, drifting jazz-dub instrumentals like the title track, through to breathy love songs from Tsedenia, and bluesy traditional pieces featuring the messenqo fiddle or traditional krar harp, now treated to a Dub Colossus make-over, with spacey, microtonal keyboard effects added on the otherwise sparse Yigermel. For Dubulah “it’s a beautiful song that reminds me of someone sitting on a hillside at night up in Gondar, in the north of the country, looking up at the sky with a fire going. I’ve got traditional recordings of the track, but there was no point in just providing a traditional Ethiopian Azmari album”. Songs like Kuratu, a soulful, thoughtful piece about the sometimes secretly dominant role played by women in Ethiopia, sung by Tsedenia, showcase the inventive piano work by Samuel Yirga, whose solo album, produced by Dubulah, will be released on Real World later this year and promises to be a superb mix of Ethio-jazz, solo piano and soul. Guragigna, a live show favourite, which features lead vocals by Mimi, is a ferociously funky Ethiopian song which sounds like a blue taxi going at full speed with no brakes during rush hour in Addis Ababa. Mixed in with all this there’s one other key influence, the jazz styles that became so important during the ‘golden era’ of Ethiopian music back in the Sixties and early Seventies; music that is now rightly popular among Western fans, following the success of the Ethiopiques compilations from the period. This was the time of Emperor Haile Selassie, a fan of brass ensembles and jazz – though not the reggae so beloved of the Rastas who deified the ageing ruler! – when some of the country’s greatest players could be heard performing with the Police or Army Band, or the Imperial Bodyguard Band. It was a music scene that collapsed during the repression of the Mengistu regime, when many musicians fled to work in the West, but is now recovering. “For twenty years there were no brass sections in Addis”, said Dubulah, “but now a whole new jazz-flavoured live scene has emerged there”. One of the best new horn sections are the Bole Better Brass, session players who regularly work with Feleke Hailu and Samuel Yirga in Addis, and can be heard on two tracks here. 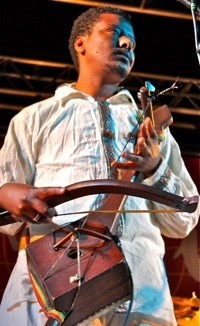 They are featured on a driving instrumental treatment of Feqer Aydelem Wey, an instrumental treatment of a song by the Ethiopiques star Ayelew Mesfin, and again on the album’s final track, Gubeliye. 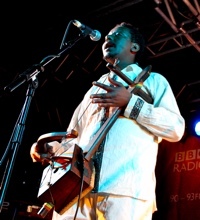 Written first by Feleke, who adds an assortment of different brass and reed instruments, and then finished by Dubulah, this is a driving piece that’s very different to anything else on the album, an experimental “soundtrack to the madness of Addis” that mixes big band styles and dub, with sturdy brass work matched against an equally sturdy bass line. 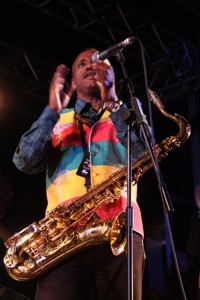 It provides a powerful ending to a set that marks yet another landmark in the colourful and wildly varied career of Dubulah, whose interest in reggae started when he played in a school reggae band in Hackney, east London. Since then he has “spent time trying to be an avant-garde composer and failing miserably, living in a squat in Stepney with one cold water tap and large rats”, before working with reggae star Mykaell Riley “so I went from trying to sound like Bartok to playing in the style of the Mighty Diamonds, Black Uhuru and Steel Pulse!”. He moved on to form Trans-global Underground with Tim Whelan and Hamid Man Tu, recording six albums with these world music mavericks, famous for mixing beats with a wide array of global influences, before leaving to form Temple of Sound with Neil Sparkes. Along the way he became a prolific producer, working with the likes of Natacha Atlas.